The ‘Anti-Leprosy Day’ being observed every year on the Martyrdom Day of Mahatma Gandhi to make people aware of the real need to fight the infectious disease. 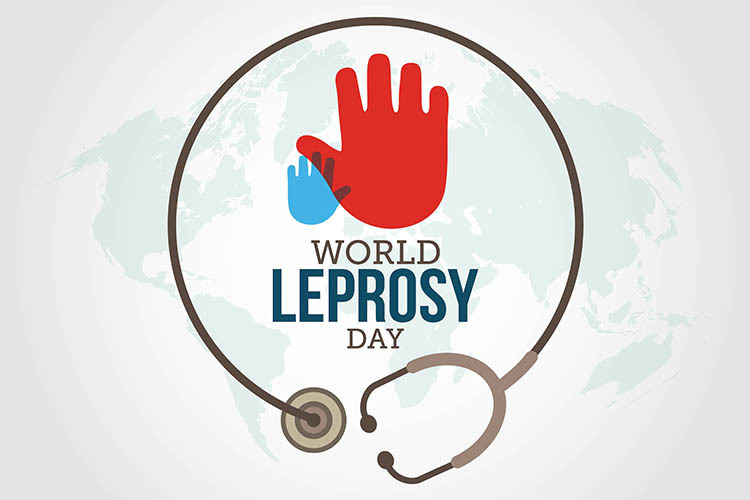 A campaign Leprosy Awareness Campaign ‘Sparsh’ has been organized in all the Gram Sabhas throughout the country by the Central Leprosy Division of the Health Ministry. The campaign carries important information about the disease to help affected people. It includes free of cost multidrug therapy that is available at all government dispensaries, health centres, and hospitals to provide complete treatment. Leprosy (known as Hansen's disease) is a chronic, progressive bacterial infection caused by the bacterium Mycobacterium leprae. Today, nation remembered the ‘father of the Nation’ Mahatma Gandhi on his 71st death anniversary. President Ram Nath Kovind, Vice-President Venkaiah Naidu, and Prime Minister Narendra Modi have paid tributes Bapu at Rajghat in New Delhi. Gandhi was the pioneer of non-violence and practised it throughout his life. Nathuram Godse, who assassinated Gandhi on 30th January 1948 (at 5:17 P.M.) in the compound of Birla House (now Gandhi Smriti) by firing three bullets into his chest. Gandhi's journey in India began in 1917 by launching Satyagraha from Champaran, Bihar (the first non-violent) resistance to the British rule. His struggles brought freedom to a country which had been under British rule for about 200 years. This will significantly lower the airfare thus saving Haj pilgrims’ 113 crore rupees this year. First time since the independence, 2,340 women from India will go on 2019 Haj without Mehram. Goods and Service Tax (GST) is an indirect tax levied on the supply of goods and services. The Telangana government has decided to form a 'State Tiger Protection Force' to save the Tiger (Big Cat ) population in the State. The STPF armed (112-member) will be headed by an Assistant Conservator of Forests to protect the tiger population in Amarabad and Kawal Tiger Reserves. The State Forest Protection Committee headed by Chief Secretary S K Joshi took the decision to form the STPF at its meeting. The Committee decided to act tough against those felling forest trees and committing other related crimes. The Uttar Pradesh state Cabinet chaired by Yogi Adityanath has approved construction of a four-lane Ganga Expressway connecting Prayagraj to Western Utter Pradesh (Cost about Rs 36,000). Ganga Expressway will be 600 kilometres long (would be longest in the world) and can be expanded to six-lane in future. It will start from Meerut and will touch Amroha, Bulandshahr, Badaun, Shahjahanpur, Farrukhabad, Hardoi, Kannauj, Unnao, Rae Bareli, Pratapgarh before reaching Prayagraj. The state cabinet also gave approval to several other infrastructure and pilgrimage augmenting projects and schemes. A new 291 kilometres long Bundelkhand Expressway will also be constructed at a cost of 8864 crore rupees. Earlier Chief Minister Yogi Adityanath and his cabinet colleagues visited Hanuman Temple, Askhayvat at Sangam in Kumbh City. Chief Minister of Odisha Naveen Patnaik has announced “Jiban Sampark” project for the welfare of the Particularly Vulnerable Tribal Groups at the annual Adivasi Mela-2019. The Jiban Sampark Project undertaken in association with UNICEF to generate awareness among Particularly Vulnerable Tribal Groups (PVTG) in Odisha. The focus areas of Jiban Sampark Project are skill development, empowering communities, cooperation and innovation among the groups. The Maharashtra government has launched a special scheme to curb infant deaths. The scheme is applicable only for the first child and will benefit around four lakh women across the state. Each kit (Cost around Rs. 2000) contains a blanket, a small mattress, a towel, a thermometer, baby oil, shampoo, toys, nail-cutter, gloves, socks, among other things. Child Development Minister Pankaja Munde distributed baby-care kits to the children born in primary health centres and government hospitals. Poonam Khetrapal Singh has been appointed as the Regional Director of the World Health Organization (WHO) South-East Asia, for a second five-year term. Dr Khetrapal Singh started her five-year term as Regional Director on 1 February 2014. She served for over two decades as a civil servant in India as a member of the Indian Administrative Services. A director is a person from a group of managers who leads or supervises a particular area of a company. The Reserve Bank of India (RBI) has decided to conduct the purchase of government securities under Open Market Operations (OMOs) for an aggregate amount of Rs 375 billion (Rs 37,500 crore) in February this year to increase liquidity. Three auctions of Rs 125 billion each during the 2nd, 3rd and 4th week of February 2019(no auction during the first week). RBI has been monitoring the evolving liquidity conditions and durable liquidity requirements of the system. A central bank uses OMO as the primary means of implementing monetary policy. Repurchase agreement (REPO): Is short term and are subject to repurchase. The central banks of the UAE and Saudi Arabia have launched a common digital currency called "Aber". It will be used in financial settlements between the two countries through Blockchains and Distributed Ledgers technologies. It will establish an additional means for the central financial transfer systems of the two countries and enable banks to directly deal with each other in conducting financial remittances. Both the United Arab Emirates Central Bank (UAECB) and the Saudi Arabian Monetary Authority (SAMA) are studying the impact on the improvement and reduction of remittance costs and the assessments of risks. The International Cricket Council (ICC) has announced fixtures for the ICC T20 World Cup 2020 (Australia) in 2020. The men's event will take place later in the year from 18 October to 15th November. 20The women's T20 World Cup will take place from 21st February to 8 March in 2019, culminating with the final on International Women’s Day. This edition marks the first occasion when the men and women tournaments will be held as standalone events in the same year and in the same country. The Indian men's cricket team is in Group 2, which also includes England, South Africa, Afghanistan and two qualifiers. India women are in Group A along with Australia, Sri Lanka, New Zealand and Qualifier 1. French sailor Jean-Luc Van Den Heede (73-years) has won the round-the-world yacht race after 212 days alone at sea without modern instruments. He became the oldest to complete the 30,000-mile Golden Globe race. 19 sailors who started out in July 2018, only 5 were still in the race. The race involves solo sailors navigating with a sextant and paper maps and communicating only occasionally with the outside world via short-wave radio.